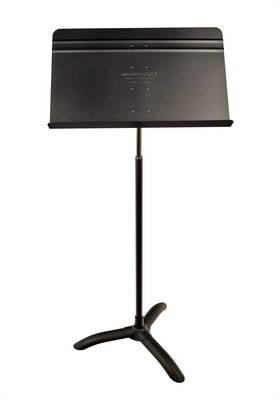 The best selling Manhasset Symphony Music Stand is one of the longest lasting, most durable music stands on the market. Easy, automatic no-knob friction-tilt neck delivers constant tension at any tilt position and the original "Magic Finger Clutch" provides one-hand friction grip. Solid-brass bearings, a greaseless heavy-duty chrome inner shaft and a heavy-gauge all-steel welded base provide excellent stability at any height.